BRENTWOOD, TN – June 17, 2016 – Continuing on its mission to change the lives and fortunes of established, new and up-and-coming artists and musicians, leading artist development company PCG Nashville (www.pcgnashville.com) proudly announces its 3rd Annual PCG Summer Bootcamp, set to take place in Nashville Friday and Saturday, July 22-23. Hosted by PCG co-founders Bernard Porter and Molly Porter, the event is designed as an intensive workshop that allows registrants to work hands on with leading music industry coaches in vocal training, songwriting, live performance, social media marketing, media training and many more realms. Special guests this year include American Idol Social Media Marketing Consultant and former Taylor Swift manager Rick Barker; Nine North Records President and CEO Larry Pareigis; Award winning video director Carl Diebold; and music marketing & PR expert and book author Wade Sutton. 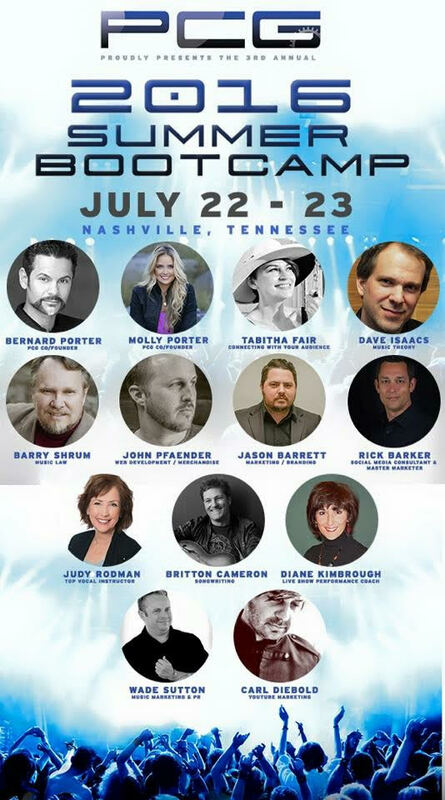 Other top flight industry pros who will be mentoring attendees in their specialized fields include Tabitha Fair (Connecting With Your Audience), Dave Isaacs (Music Theory), Barry Shrum (Music Law), John Pfaender (Web Development/Merchandise), Jason Barrett (Marketing/Branding), Judy Rodman (Vocal Instruction), Britton Cameron (Songwriting) and Diane Kimbrough (Live Show Performance).